It is stone built with a pink/reddish sandstone, with stone originally from either the local beach or from a small quarry further along the shore. It has been restored to modern standards using the original footprint, but with an extra full sized door and an additional porch on the entrance side, leaving the low sea door where it was. The fireplace is still in the same place with a wood burning stove. You do not have to cook there - there is a galley kitchen instead! The shower room with toilet is not outside but integrated into the house. 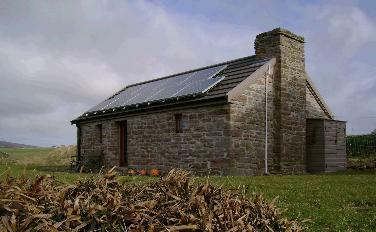 The cottage is kept warm from a ground source heat pump via underfloor heating. This means that the cottage is always warm, 24/7. And dry! Even more up to date, Old Point now has solar photovoltaic panels on the roof. The cottage is not on mains drainage, there is a septic tank, so I try always to use eco friendly cleaning products. I leave containers of Ecover cleaning materials for guests to use, and refill them when empty. We now have an alternate weekly collection of rubbish and recyclates - so we can recycle glass, certain plastics, cans (washed with labels taken off) and paper. 2 bins with blue lids and 2 bucket inserts! There is a list in the cottage of what to put where. I am also happy to dispose of compostable materials in my compost bin. I'm sure there are many other ways I could be greener - if you have any ideas, let me know!